Powers/Abilities: None, but he was a very skilled climber. History: (Marvel Spotlight II#11 (fb)-BTS) - As a young man, Monty Walsh was sent to Attica State Prison, where he was taught the finer points of cat-burglaring, despite the warden's attempts to put Monty on the straight and narrow. After his release, he became one of the best cat burglars in the business. Caught and sent to prison again, Walsh sought to prove his detractors wrong about him being "washed up." To do so, he set out to do one last job, rob the apartment of former Maggia boss Guido Carboni. (Marvel Spotlight II#11) - Unfortunately for Walsh, Carboni came home early from his club, catching the would-be thief still trying to scale down the side of the building. The mob boss ordered his men to kill Monty, and they shot him three times in the chest. As he fell towards the ground, he was engulfed by the Enigma Force and turned into Captain Universe. The newly-empowered Walsh used this opportunity to attack Carboni's operations, which included a stolen car racket and heroin dealers. 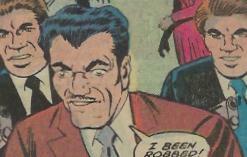 Gaining the attention of the city (including J. Jonah Jameson, who saw Captain Universe as a true hero, unlike Spider-Man), he also gained the ire of Carboni, who did not realize this new hero was the man he ordered killed. Captain Universe decided to end the cat-and-mouse game, arriving at the Carboni Club to directly confront Guido. There, he chased the crimelord into his office. However, when he chose to use the Enigma Force to try to kill Carboni and take his place as a major mob leader, the Force left his body. This also, unfortunately, left him in the state he was in when it entered: dead from multiple gunshot wounds. When the police entered the room, they found Carboni raving that the dead man in the room was Captain Universe. Comments: Created by Bill Mantlo and Steve Ditko. There is a Monty Walsh who comments on Spider-Man gaining the Uni-power/Enigma Force in Marvel Year In Review '89. However, since Walsh was pretty much dead at the end of his tale (and yes, I realize this is the Marvel Universe we're talking about), I see no reason to put this in-continuity. It was either an imposter or another Monty Walsh who had become Captain Universe. 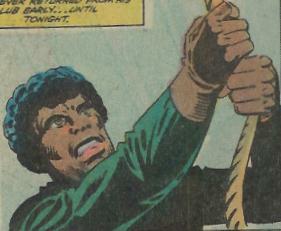 Or vestiges of the Uni-Power resurrected him, or any other means that resurrect a couple dozen characters each year. Still, I think it best to leave Walsh dead, and have it be an early appearance of Dead Ringer! 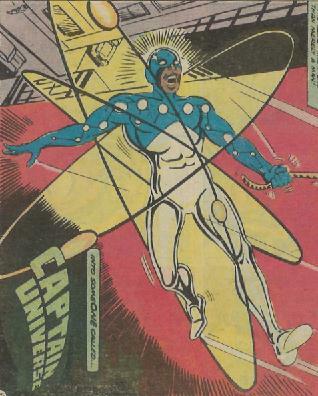 Captain Universe (Arcturus Rann) --Micronauts I#35? A former Maggia boss, Carboni used his nightclub, the Carboni Club, as a front for many illegal operations. After he ordered the death of Monty Walsh for attempting to rob his apartment, he was terrorized by the mysterious Captain Universe. While trying to lobby a senator to legalize casinos in New York at his club, Carboni was attacked by Captain Universe and chased into his office. There, Universe tried to kill Carboni, but when he did, he reverted back to the dead body of Monty Walsh. When the police entered, they found a raving Carboni claiming the body with gunshot wounds was Captain Universe. However, the officers could see the body had been dead for days, and decided it was a perfect time to search Carboni's office for anything else.